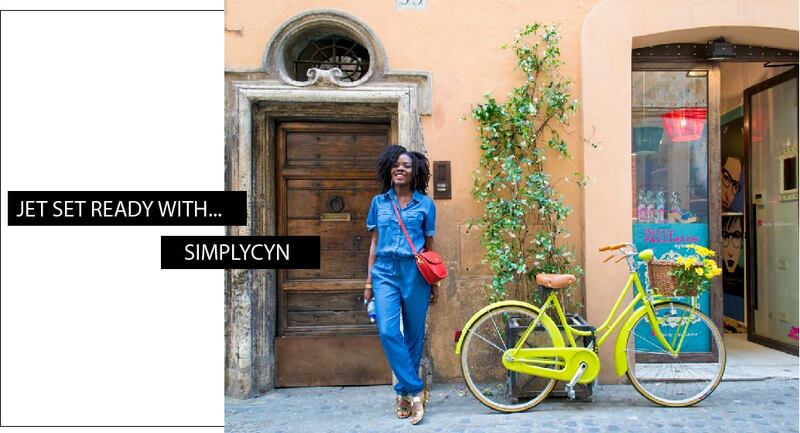 The last post in the ‘Jet Set Ready With…‘ series is in collaboration with Cynthia of SimplyCyn. This New York based jet-setter-blogger-attorney is one travelista that is packed with style as she trots around the globe in effortless chic attire. So, of course I wanted to know how she manages to look so stylish with her long haul travels crossing over the Atlantic, as if she pack the best stylists in her suitcase! Below Cynthia was quizzed on her beauty and travel style secrets. Hope you enjoy the insider deets as much as I did. 1. How do you get ready for a holiday? I binge on travel mags and blogs trying to make sure I’ve captured all the necessary elements of my itinerary. I’ve had many friends tell me it sounds like work, but there’s really nothing more fun for me than the planning stages (besides maybe the actual trip). 2. What’s your beauty routine before a flight? I have 2 simple rules, a good moisturizer and no makeup. 3. What’s your go to fragrance for your getaway? 4. What’s your favourite beauty treatment? A mani -pedi. Once the nails are done, I just feel a lot more put together. 5. Do you do anything extra to get beach ready? A big part of why I travel is to try foods from around the world. With that in mind, I’m much more mindful right before a trip and try to avoid fried or heavy meals. Also, I make sure to get in a lot of walking once I get to my destination to counter all the food I eat. 6. Do you have a beauty regime for looking refreshed after a long haul flight? I usually go straight from airport to hotel, where I take a shower, slather on moisturizer ( I love Origins GinZing Energy boositng Moisturizer ) and a little-tinted lip balm (burts bees) and eyeliner go a long way. 7. Have you discovered any beauty treatments/brands on your travels that you have now incorporated into your beauty routine or lifestyle? 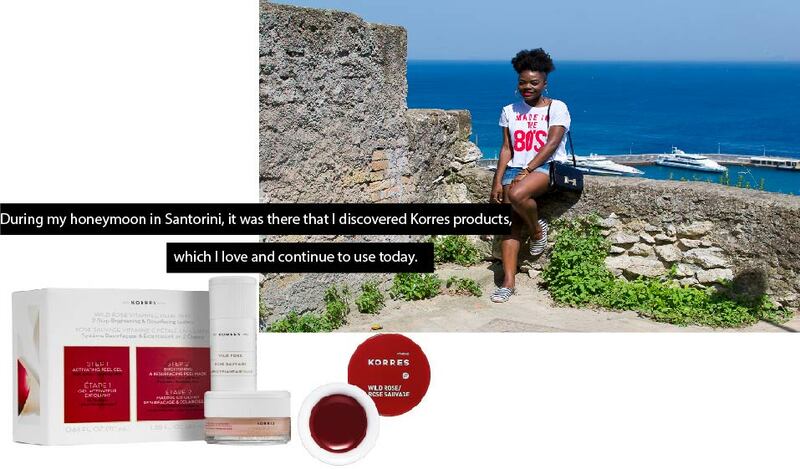 Korres was not as prevalent in the US 6 years ago during my honeymoon in Santorini, it was there that I discovered Korres products which I love and continue to use today. 8. Does your skin care routine change for different seasons or areas around the world you are traveling to? Not mutually exclusive- I like to find comfortable but stylish outfits. I definitely stick to more classics, but I throw in a few unexpected items just in case. I also love to shop my destination, so a lot of my travel style ends up being dictated by what I find in the shops. Yes, less is more. Pack multi-purpose clothing. The white shirt that can be worn many ways, with or without jewelry, with or without scarf. 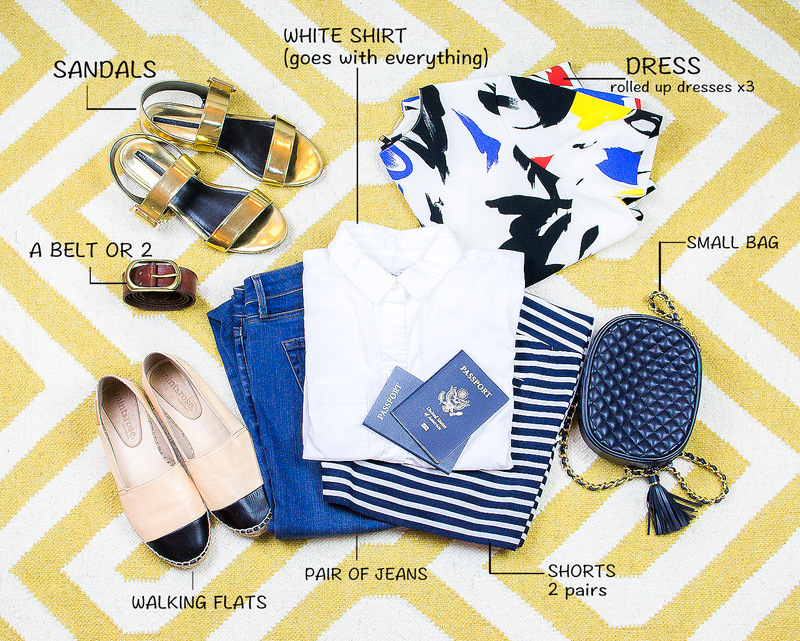 use jewelry and accessories to make your travel wardrobe seem bigger than it is. I am also getting in using packing cubes to save space in my suitcase. Some great tips there – There's nothing worse than wearing make up on a long flight!